E-mail us at mrtropicalfishguy@gmail.com with any questions. Mr. Tropical Fish Guy is a great website for all you need to know to start up have a happy, healthy aquarium. If you have only one betta, a fish bowl is fine. If you have a tank with any fin-nipping fish such as cherry barbs, tiger barbs, or any type of tetra, buy a betta cage or breeding trap from your local fish store. He could go inside it and will be safe from fin niping. 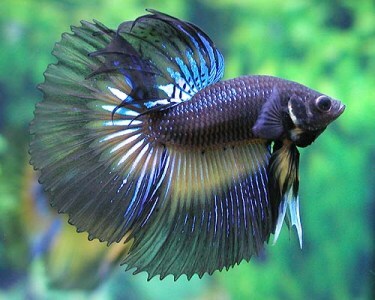 Thier are many kinds of bettas.They come in colors like red, blue, black, white,orange,and even purple. 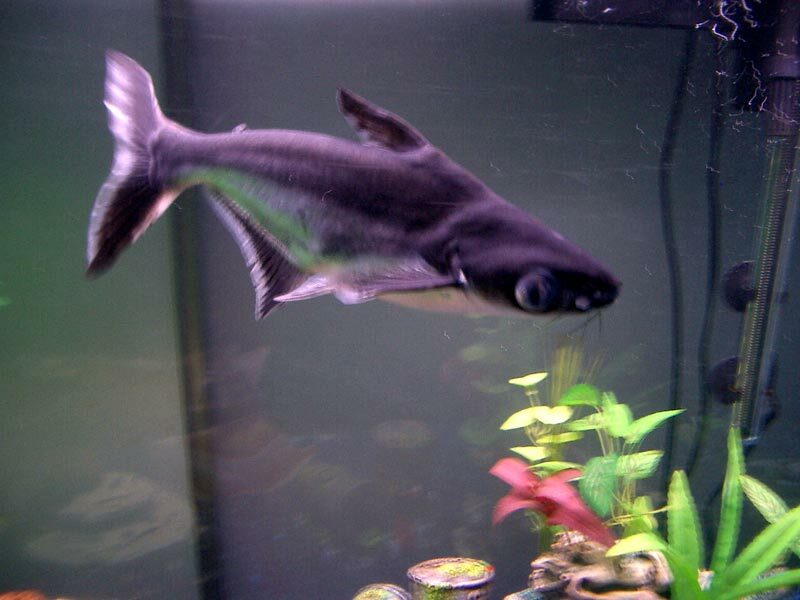 This is a red tailed shark. 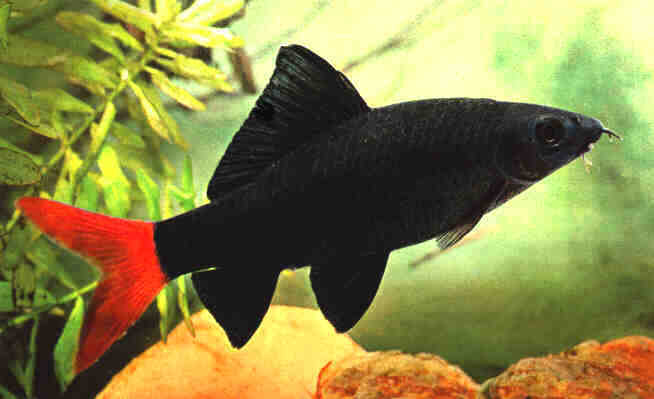 They are best kept in a semi agressive tank but can be kept in a community tank if their aare no small fish.They are black with a red tail fin. If you have a small tank it is best only to get one unless it is a female,If you have a big tank get 3 or more. The tank should be at least 30 gallons. Clown loachs do a lot better in packs of 3 or more or they will hide . 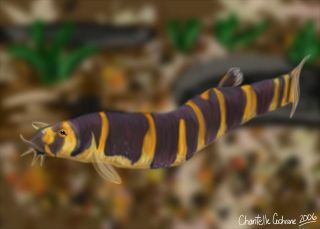 They often school with tiger barbs. Tiger barbs are better in schools of 6 or more. They will nip the fins of a long-fin fish. It is better to keep them in a semi-aggressive tank. Iridesent sharks will eat any food you put in the tank. They are very peaceful, nice fish but do better . 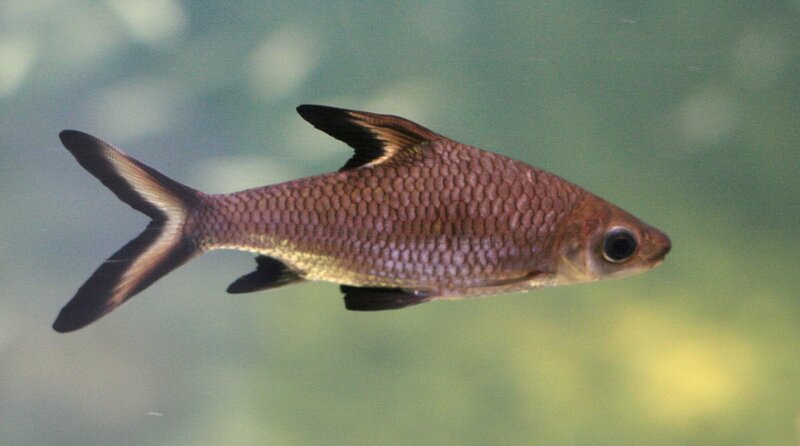 in a semi-aggressive tank but can also be kept in a community tank if thier are no small fish..They can grow large, so be sure to get them at a small size. Cherry barbs are fin nipers . 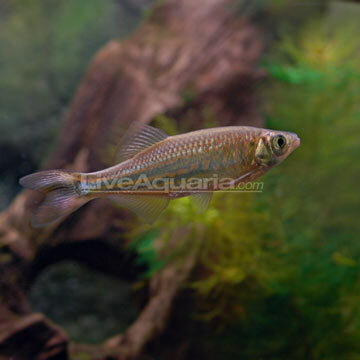 They make a great community fish as long as there are no long finned fish, like guppies. 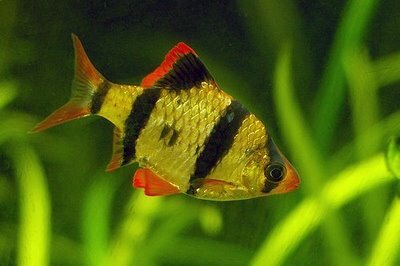 They can also be kept in a semi agressive tank.Cherry barb males turn bright red during breeding season to atract a mate. Females are more gray then red. The Golden Dojo Loach requires a 30 gallon or larger aquarium with plenty of hiding places and water temperatures between 68 and 82 degrees. They do well in a planted aquarium. They look like small ells and are simaler to khuli loaches except that they are biger and are orange. Helps keep filter and gravel clean and conditions new aquariums. 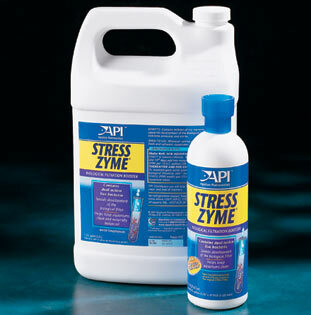 Helps keep a naturally balanced aquarium by eliminating sludge build-up & preventing ammonia & nitrite poisoning, low oxygen levels, and low pH. Use when setting up and maintaining an aquarium. invertebrates, and plants. For new aquariums. Add weekly in established aquariums. Tank: 36 inches when small. Due to their social structure larger is needed for proper care. 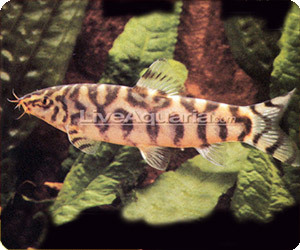 kuhli loaches are shy fish that like to hide among driftwood, plant roots, rocks, and caves. 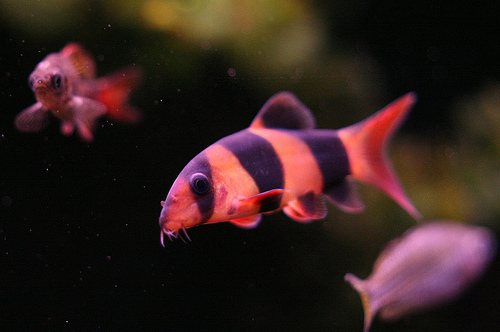 They are nocturnal fish that are more active during the night.They are similar to golden dojo loaches. 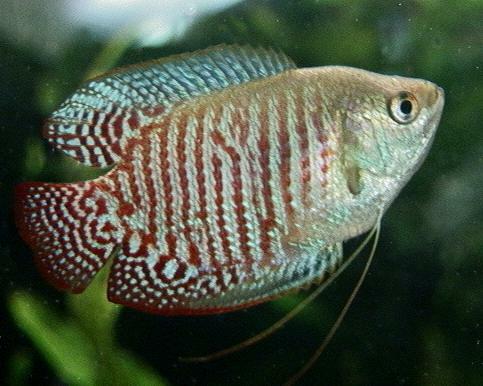 Gouramis are an excellent addition to any semi-aggresive tank. They are not very hardy.They are manny different kinds of gorumis. 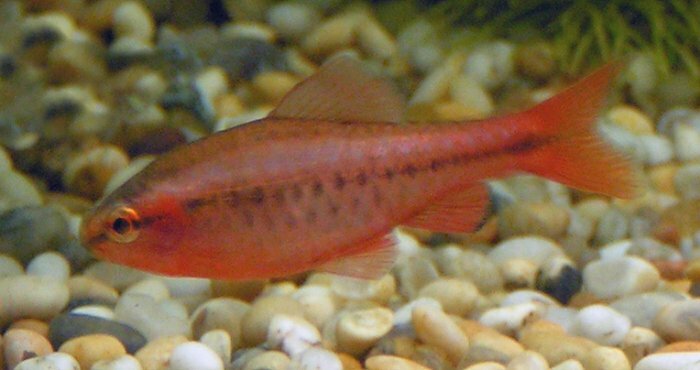 some include dwarf, blue and flame dwarf.They can also be in a community tank if their are no small fish. Strata: All, mostly top and middle. The world's favorite fish food continues to be the innovation leader. The latest version of this 55-year-old original has been optimized with the fishkeeper's success in mind. 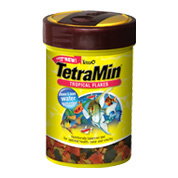 Perfect for bringing out the best energy and condition in your Bettas , fancy guppies and irridesent sharks. 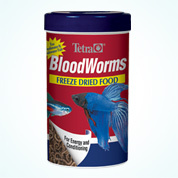 Also great as a reward for small and medium-sized tropical and marine fish. Freeze dried.